Wymeswold FC will head back to Holmes Park for the second year running as the club hunts county silverware once more. The club’s reserves side fought back to beat Scraptoft United on Saturday and book their place in the final of the County FA Saturday Vase. 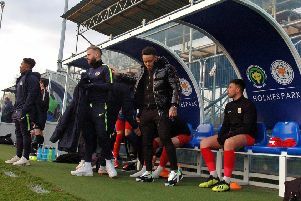 Last season, Wymeswold’s first team lifted the County Saturday Intermediate Cup, and they will hope to add another title when they meet Cosby United Development Squad in Leicester on Wednesday, April 3. They had to do it the hard way at Scraptoft as the hosts took a two-goal lead. But the visitors fought back magnificently with a Linford Harris double and goals from Kaine Laird, Jake Perkins and Daniel Robinson completing a 5-2 win. Another club hoping to win back-to-back county cup finals is Queniborough who play their Saturday Trophy semi-final this weekend. The Leicester and District League side won the trophy last April, but must get past Forest East at home on Saturday if they are to clinch another Holmes Park final. Kick-off is 1.45pm. In the other semi, GNG Reserves won 6-2 at Woodhouse Imperial.